In my article about Sniffing SAP GUI passwords in Nov. 2012, I took a look at several state-of-the-art sniffing tools for capturing SAP GUI passwords. 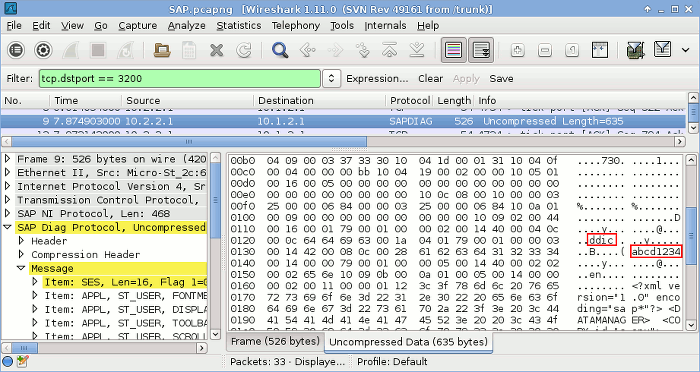 One of those tools was a Wireshark plugin by Martin Gallo of CoreLabs — unfortunately it refused to compile over and over again, which is why I never tested it… but meanwhile Martin released an improved version. In contrast to the other Wireshark plugin by Positive Research, this one does not only decompress, but also dissect almost all parts of the traffic and shows the respective fields and values (below you can see a DDIC login with the password in plain text). Another invaluable advantage is of course its availability as source code!